Deciding the best time to visit Vietnam greatly depends upon how far north or south that you begin, as well as other factors such as festivals and holidays. In general, the best time to visit Vietnam is during December through February when temperatures are milder and rain is minimal. 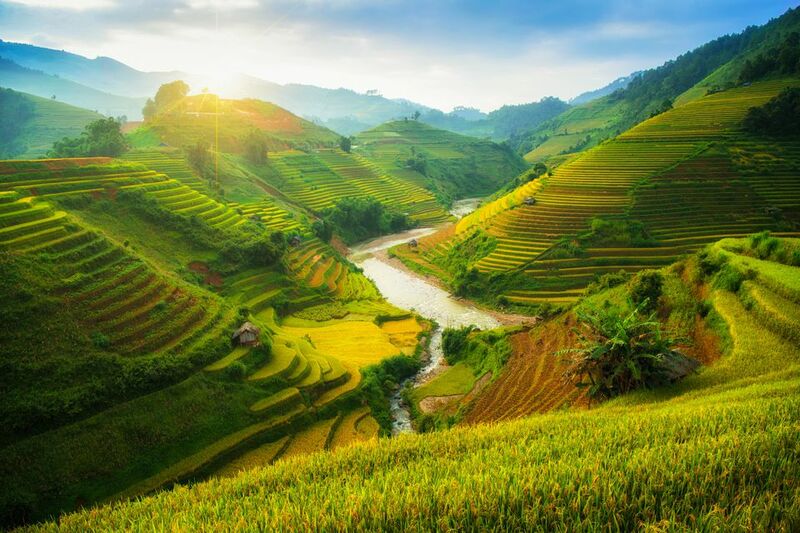 Vietnam's long, narrow shape means that the three primary regions (north, central, and south) experience different types of seasons and weather events throughout the year. Choosing when to go to Vietnam is important, both for personal comfort and packing purposes. The south generally receives more rain and enjoys a tropical climate, however, Hanoi and points farther north have cooler winters than many travelers expect. The area is one of the few places in Southeast Asia you can really feel cold without going to higher elevations. Vietnam can be enjoyed at any time throughout the year, however, weather plays a big factor—particularly if you plan to enjoy trekking and outdoor activities. Sometimes monsoon rains can become so heavy in urban areas that streets flood and transportation shuts down completely! Although Vietnam still receives a little rain during the dry season, the driest months for visiting the south of Vietnam (Saigon) are typically between December and April. Temperatures and humidity levels in March and April can be suffocating before monsoon rains begin to cool things off in the summer months. The spring and autumn months are most pleasant for visiting the north of Vietnam (Hanoi). Winter nights can get relatively chilly, with temperatures dipping into the 50s. Much colder has been recorded. You'll certainly need a jacket when visiting Halong Bay in the winter, particularly if you're already accustomed to warmer temperatures in the south or other countries around Southeast Asia. As with most destinations, Vietnam can still be enjoyed during the monsoon season (April to October), but there are some caveats. You'll meet far fewer travelers and a lot more mosquitoes during the rainy season. Negotiating better prices for accommodation becomes easier, and tours may be cheaper, but outdoor activities such as exploring the Citadel at Hue become soggy experiences. Transportation delays happen. Buses may not run during long periods of heavy rain — perhaps a good thing as roads become flooded and more dangerous to drive. Even the low-lying tracks along the north-south railway become flooded, causing delays in train service. If your plan is to travel between Hanoi and Saigon, have a flexible itinerary in case weather causes delays. You may be better off flying into the part of Vietnam you wish to visit rather than trying to travel long distances overland during monsoon season. Regardless of the season, large weather events such as tropical depressions and typhoons blowing in from the east can create week-long downpours that disrupt trip plans. Sometimes they can devastate areas that are prone to flooding. Although Mother Nature doesn't always play by the rules, typhoon season typically ends around December each year. The start dates depend upon which part of Vietnam (north, central, or south), but August is a general starting point. October tends to be a stormy month overall. The good news is that typhoons don't normally sneak up on a country unexpectedly. Keep an eye on weather events as your trip approaches. If a typhoon is moving into the area, flights may be diverted or delayed anyway. The largest national holiday in Vietnam is the Lunar New Year celebration known as Tet. During Tet, transportation and accommodations go up in price or become booked solid as people move around the country celebrate or visit family. An influx of Chinese tourists traveling for Chinese New Year hit popular beach areas such as Nha Trang. Although Tet is an extremely interesting and exciting time to be in Vietnam, your travel plans will certainly be affected, so book ahead and arrive early. Tet follows a lunisolar calendar—after all, it is Lunar New Year—so dates vary from year to year, usually coinciding with Chinese New Year. It's one of the largest winter festivals in Asia and occurs between January and February. Other big national holidays include May 1 (International Worker's Day) and September 2 (National Day). Reunification day on April 30 celebrates the reunification of North Vietnam and South Vietnam at the end of the Vietnam War. Local families may be traveling during these times. The Mid-Autumn Festival (Chinese Moon Festival) is observed in September or October (based on the lunisolar calendar). March and April in Vietnam are quite hot, with temperatures averaging around 80 degrees Fahrenheit. Typically, rain begins in full force by late April and by May, the heat and humidity are intense. The upside: Fewer crowds. International Labor Day is held on May 1. Celebrations and parades are held in central squares throughout the country. Saigon Liberation Day is celebrated nation-wide on April 30. Summertime weather can vary depending on where you are in the country. The south is quite warm, with highs climbing above 90 degrees Fahrenheit regularly, and is often victim to frequent heavy showers. If you're in the northern part of the country, you'll want to bring plenty of insect repellant—mosquitoes are at their peak, thanks to frequent heavy rainfall. National Day celebrates the rise of the Socialist Republic of Vietnam on September 2 each year. Rains continue through September and October, but typhoons can cause rough seas. Unsuspecting tourists should also beware that central regions of Vietnam are subject to hurricanes during the fall months. During mid-September, Haiphong hosts the Do Son Buffalo Fighting Festival. The Mid-Autumn Festival, also held in mid-September (on the half-moon of the eighth lunar month, to be exact), is popular with kids and includes dance and sweets. At last, come December, the country dries out. Winter marks the best time for seaside vacations in Vietnam, but the northern part of the country can be quiet cool and gloomy. Expect temperatures in the around 50 degrees Fahrenheit and occasional drizzle. Vietnam's Traditional Lunar New Year Festival (Tet Nguyen Dan) is celebrated country-wide. Spanning four days, this national holiday, called Tet, typically begins New Year's Eve and is then celebrated for the first three days of a Lunar New Year.